Flowers corolla magenta (H14), 6mm long x 3mm diameter; calyx magenta (H14), 4mm long; anthers brown; I -IV(V); foliage: mid to dark green; young growth cream; habit: vigorous plant, spreading to 0.6m, to 0.4m tall, after 10 years (not pruned). 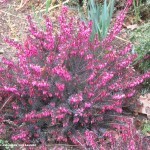 Similar to ‘Kramers Rote’ but with brighter flowers and cream new growth. 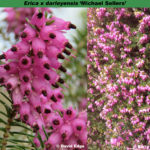 Origins: Seedling (EES 77-1) raised in 1977 and selected in 1979 by Barry Sellers from among seedlings of Erica erigena ‘Superba’ that had been deliberately cross-pollinated; pollen parent not recorded but probably Erica carnea ‘Myretoun Ruby’. 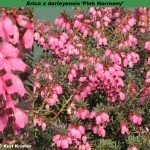 Named by Barry Sellers after his late father. ® E.2016:03 registered by Barry Sellers, Norbury, England. Flowers: corolla heliotrope (H12, RHS 73B), to 6mm long, 3mm across, calyx shell pink (H16), 3mm long; anthers black, style end cerise (H6); XII-V; foliage: mid-green, with bright green young growth; habit broad, bushy: after 3 year in 40cm tall; spread 40cm (pruned). 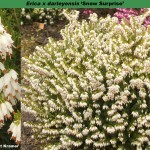 Flowers bigger than ‘Winter Treasure’. Deliberately raised seedling (pollen parent 94-5-39, seed parent 94-5-35) produced by Kurt Kramer, in 2007; selected in 2011. ® E.2016:06 Registered on 18th February 2016 by Kurt Kramer, Edewecht, Germany. At time of registration as 'Pink Magic' (E.2013.03) stated to be a tetrapod. Flowers mauve to heliotrope (H2 / H12) in spikes to 8cm long, corolla urn-shaped, to 7mm long, maximum width 5mm; calyx dark mauve, to 4mm long; anthers very dark red, fully emergent; II-IV; foliage dark green above, pale green below, to 9mm long, linear; habit upright; height to 45cm tall; spread 35cm after 5 years (not pruned). Differs from ‘Kramers Rote’, more upright habit and more “red”. Deliberately raised seedling, cross made by Johannes van Leuven in February 2008; selected February 2010; EU-Sortenschutz SR-2 (Torero). Named after a bullfighter. registered on 6th April 2015 by Johannes van Leuven, Geldern, Germany. ® E.2015:02. registered on 6th April 2015 by Johannes van Leuven, Geldern, Germany. Flowers clear white; III-V, corolla 5mm long, 2.5mm across; anthers dark brown; calyx white, 2.5mm long; foliage light green; height 25cm; spread 30cm after 3 years (not pruned). Sport on 'White Spring Surprise' in winter 2007; found by Kurt Kramer; introduced autumn 2011. ® E.2014:02 registered on January 2014 by Kurt Kramer, Edewecht-Süddorf, Germany.